The use of freeze-dried fruits dates back to the 15th century, when the Incas discovered that leaving their fruits to freeze and then dry out at the high altitudes the Andes created a dried fruit that was tasty, nutritious and easy to store for a long time. The modern freeze-drying process has allowed for a wide range of uses, including ice cream that that has been eaten in space, as well as fresh, flavorful fruits that have been enjoyed at the top of Mount Everest. Clearly, freeze-dried foods have numerous applications that are only limited by your imagination. Moms will be happily surprised when their kids request freeze-dried fruit for their lunchboxes, never knowing how healthy such a sweet tasting food truly is for them. And when added to their morning yogurt, they’ll leave the house full of energy and ready to take on the day. Besides convenience, freeze-dried fruits retain their natural composition, ensuring that they maintain their inherent vitamins and nutrients, plus, they are low in calories and are great source of fiber and antioxidants. They also have a shelf life of up to 30 years, making them a great addition to any food storage program. Freeze-dried fruits can be rehydrated with warm or cold water, making them easy to prepare and enjoy. Some of the best fruits to freeze-dry are raspberries, bananas, blueberries, apples, mangos, pineapples, blackberries and strawberries, to name just a few. In addition to food storage, freeze-dried fruits are a great way to add nutritious flavoring to cereal, oatmeal, muffins, pancakes, waffles, cookies, cobblers, smoothies and trail mix. Their versatility and light weight make them a favorite for hikers, mountain climbers, bikers, campers, fishermen, hunters and just about anyone who enjoys a healthy and flavorful boost to their meals and snacks, wherever they choose to enjoy them. Berry Smoothie: take one cup of your favorite freeze-dried fruit and put it in a blender. Add one cup of non-fat milk and ½ cup ice. Simply blend until smooth and you’ll end up with the best tasting smoothie you’ve ever enjoyed. Strawberries & Cream Milkshake: start with placing two cups of freeze-dried sliced strawberries into a blender. Add four cups of low fat milk and ½ cup of honey. Toss in 24 ice cubes and blend until smooth. You can share this rich tasting, low fat dessert with your family and watch how happy they’ll be with such a delicious treat. Another added benefit to using freeze-dried fruits in your meals on a regular basis is the low to no waste factor. Studies have shown that Americans waste up to 40% of their food. That totals out to 1.3 billion tons of food per year, costing a combined total of over $680 billion annually, or approximately $1,600 per family. A vast majority of our wasted food is attributed to spoilage. That’s why using freeze-dried fruits that can last up to 30 years is a great way to conserve food and money. 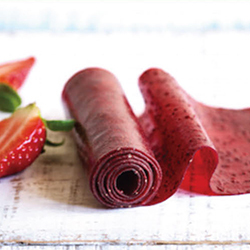 Another way to enjoy freeze-dried fruit is to use it as a way to add a new spin to your old favorites. Experiment on your tried and true recipes—like chocolate chip cookies—by adding a cup of rehydrated blueberries or strawberries and you’ll pleasantly experience a whole new taste sensation. Not only will your meal be healthier and tastier, it will open your eyes to all kinds of future possibilities with other favorite recipes. There’s one last use for freeze-dried fruits we haven’t mentioned yet. We would be negligent if we didn’t include a mention of how fantastic freeze-dried fruits are in beverages for grown-ups—with or without alcohol. Everything from Mango Margaritas to Strawberry Daiquiris can be made with rehydrated freeze-dried fruits. Everything from a tropical Mai Tai to a strawberry Margarita are easy to whip up year round when you have some freeze-dried fruit in your cupboard. All you’ll need is some Hawaiian music to make a November indoor beach party seem like summer. As you have just discovered, keeping plenty of your favorite freeze-dried fruit on hand can open the door to fresh and fruity meals and drinks. 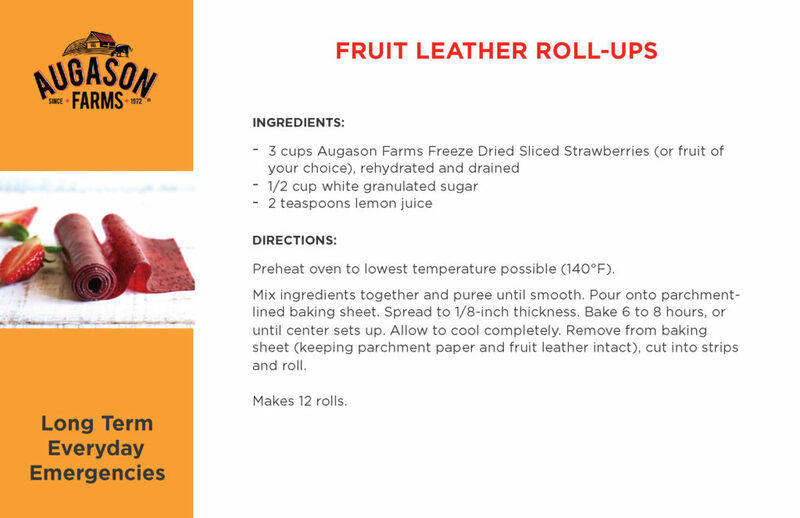 The more you use freeze-dried fruit, the more ways you’ll discover their true versatility. Macey’s has teamed with Augason Farms to offer emergency food supplies and long term food storage to our valued customers for good reason. They’ve been in the business since 1972 and guarantee their products for great taste and superior quality. 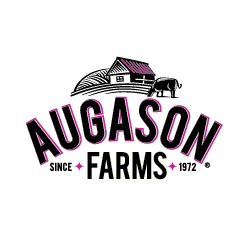 Maintaining a supply of Augason Farms products in your home is ideal not only for your emergency food supply but for everyday use as well. With Macey’s and Augason Farms, preparedness is simple and affordable! Simple to make and perfect for summertime, back to school or on-to-go occasions. Most people agree that creating a stockpile of emergency food storage and supplies is an important concept. However, once you start looking into detailed lists of all the recommended items, it’s easy to start feeling overwhelmed with the budget aspect. The good news is there are a lot of easy ways to cut costs to building your emergency supply plan. It may take a longer time to create your 3-month supply, but your bank account won’t take a harder hit. First, set up a list of the most important items to collect in your stockpile. Your list should include the following five things: water, food, lights (like flashlights), medical supplies and household and hygiene products. How you prioritize collecting those things is up to you, and obviously your timeline won’t be the same for all of those items. For example, you’ll probably be able to stockpile a 3-month’s supply of household and hygiene supplies before you complete your food supply, so you can work on different items simultaneously. Here are a few other ways that you can emergency prep while on a budget. Sit down with your family members and determine how much money you can dedicate to a realistic prepping budget. Possibly consider making little sacrifices throughout the month (eating out less, limiting your disposable income) to supplement your prepping. When you look at your prepping budget the same way as you look at home insurance or health insurance, it becomes easier to find some money. This doesn’t mean that you have to become a full-time extreme coupon clipper, but instead take advantage of sales that come up on a regular basis. Watch for shelf stable food items when you’re shopping at the grocery store and remember to take advantage of Case Lot sales each spring and fall. When items that your family regularly eats goes on sale, grab a few extra units of whatever it is and throw it in your storage. You’ll be surprised how quickly your food storage grows. Learning a skill set is great way to compensate for a lack of prepping funds. For example, you may not be able to build up big food storage right away, but you can learn how to garden and stock up on vegetable seeds. Or, study up and learn everything you need to know about keeping chickens or goats, both of which can also become sustainable sources for food. Remember, it’s not a sprint. You do not need to do everything at once, which is good news, since doing everything at once costs a lot (a lot!) of money. Just build supplies as you can, based on what you determine to be the most important in your household. Don’t be discouraged or give up! You’ll be pleased to see how quickly you can build your emergency food storage on even the tightest of budgets. 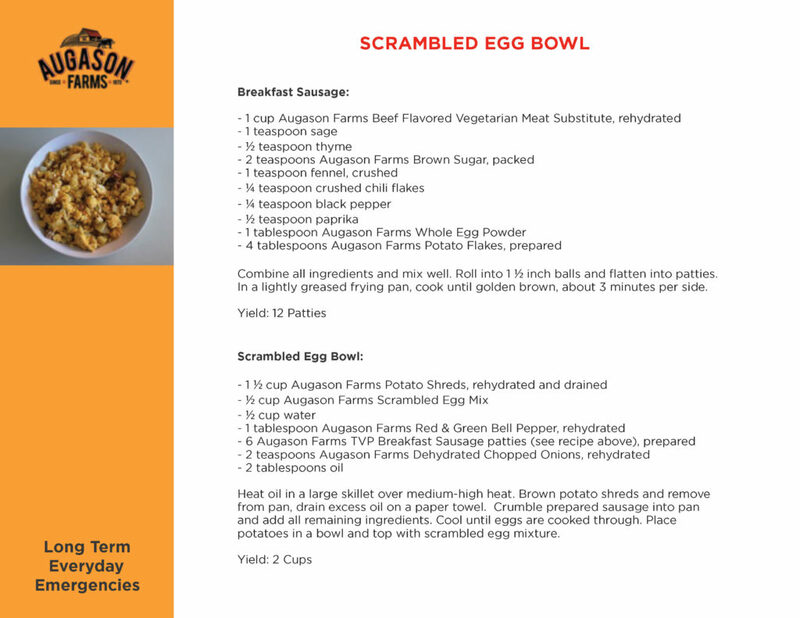 Enjoy all the classics in a delicious breakfast bowl. Carefree traveling doesn’t mean caution-free traveling. Emergencies can, and often do, occur while you are on the road and far away from home. Taking a small amount of time to do your homework before you set out may pay off in a big way if you encounter an emergency situation. Below are a handful great tips as well as links to go-to experts in the field of having fun…safely. Proper preparation and planning is half the battle when facing an emergency situation in the great outdoors. The US Forest Service lists “traveling with a companion” at the top of their list of outdoor safety tips. And, it’s a critical one. Emergencies can be as simple as spraining an ankle which can render a hiker immobile, especially on rough terrain. Be sure to visit https://www.fs.fed.us/recreation/safety/safety.shtml to brush up on all of their excellent tips for outdoor adventures. Take time to scan the beach for critical safety information before staking a claim on your beach space. Most public beaches post beach rules, safety and warning signs, and/or color-coded warning flags. Visit https://www.surfertoday.com/surfing/12814-the-complete-list-of-beach-flags-and-warning-signals to become familiar with the color coding warning flags, as they are not accompanied with explanatory text. On this site you will also find examples of safety and warning signs, many of which are universally recognized. Here’s a tip that you may not have thought of: always take a business card from the front desk of your hotel. That way, if you ever get lost, you have the name and address of the hotel in the local language. Great advice. It’s what Travel & Leisure listed at the top of their “12 Tips to Make International Travel Easier” blog. They also suggest checking the State Department’s travel warnings and alerts as well as printing out the address and contact information of the local embassy (don’t rely on having access to the internet). Check out their remaining tips here: http://www.travelandleisure.com/blogs/12-tips-to-make-international-travel-easier. It’s well worth your time if you’re internationally bound. Medical Services. Review your insurance policy ahead of time so you are familiar with service providers and medical facilities that are covered out of state or out of country. Be sure to find out where they are located, phone numbers, and hours of operation. It’s a good idea to write these down just in case internet service is compromised. Food. This is tricky, especially if you’re traveling a significant distance or internationally. If you’re traveling in a vehicle, don’t leave home without an emergency food supply [link to 72-hour emergency pail]. This will keep you nourished if you have a breakdown or make a wrong turn. If you are traveling by air, you can easily pack freeze dried fruits [link to freeze dried strawberry slices] and granola in airtight snack bags. You’ll have great tasting nutrition whether you get stuck in the airport, on the tarmac, or circling to land. These snack bags are also good to have once you’re on the ground and waiting for a taxi or trying to get your bearings in an unfamiliar city. Staying Connected. Since communication is all-important during emergencies, mobile phones are likely the best life-saving device you can own. Not only can they serve as radios and sources of information, you can load them up with apps from alert-services to shelter maps. Be sure to check with your mobile provider to see if you’ll have service in the country you’re traveling to. Roaming charges can be expensive, but a high phone bill is worth it if it keeps you safe. Don’t forget an extra phone charger. Radio Access: Take a minute to go online and search for local radio frequencies that will provide critical emergency notifications and updates. Again, it’s wise to make a written note…just in case. Documentation. Take written lists of your prescription medications, jot down insurance company contacts, and take copies of important documents such as passports and birth certificates. Alternatively, upload them to your own secure cloud server as backup. Whether digitally or electronically, always keep these within close reach no matter where in the world you are. Don’t forget that an easy way to digitally store important documents is to simply take a picture. We think it’s worth repeating the “Know Before You Go” adage as we wrap up this blog because…it just can’t be emphasized enough. Happy and safe travels this summer! Hiking – flash floods, sudden blizzards and becoming lost are just a few surprises that can turn a day hike into a serious overnight adventure. Off-Road Vehicles – if it has an engine, it will eventually breakdown. Your ability to construct a safe shelter could make a prolonged breakdown a bearable—if not survivable—situation. Hunting & Fishing Trips – many a hunter and fisherman or woman have found themselves stranded and lost after the adrenaline of maneuvering through the backcountry to pursue their game leaves them well off the beaten path. Sightseeing – it’s easy to wonder away from your group when taking in the sights of an unfamiliar locale. Knowing how to construct a temporary shelter can buy you valuable time for rescue teams to locate you. Constructing a survival shelter is an easy-to-learn and invaluable way to help you survive an emergency situation that arises even in the most unexpected situations. There are a few crucial points to remember when considering where to build. First, consider a location that will help you conserve energy. For example, if you are going to need natural materials like sticks and leaves for your shelter, make sure you choose a location near those materials. Also, try to position yourself near a water source but not directly on it (so you can avoid any possibly flooding issues). If you choose to set up under a large tree, make sure you avoid setting up under trees with dead branches. They can come down in the slightest of wind. Finally, consider factors like what direction the wind blows in your shelter site so you can avoid having smoke engulf your shelter. Following these few simple tips can improve your emergency survival situation. For more tips on choosing a survival shelter location, check out www.thesurvivalmom.com. Lean-To: A lean-to is one of the simplest and most frequently constructed primitive shelters. Meant to protect against wind and rain, it can be set up in less than an hour with a variety of materials. It’s a great option as a temporary shelter while you take the time to build a sturdier shelter. Round Lodge: Part tipi and part wicki-up, a round lodge can block wind, rain, cold, and sun. It can also accommodate a small fire for light and heat, since it typically has a small hole at the top. Ramada: A ramada is made with four posts, some lightweight beams, and some type of canopy to block out the sun. This type of shelter is most suitable for dry, hot climates, since it won’t protect against rain. Wedge Tarp: With its 5 tie down points, the wedge tarp provides an aerodynamic shape that should resist even the most biting wind and driving rain. As an added bonus, this shelter can also serve as a water collector at the same time! Tarp Wing: This unconventional tarp configuration is a great shelter solution that can, depending on the size of the tarp, give you great rain/sun protection over a large area. Tarp Tipi: A tarp tipi only requires a bit of rope, some poles, and a tarp, and is one of the most versatile and mobile shelters. It’s so versatile and easy to put together that you may want to keep all of the supplies in a kit next to all of your other survival emergencies supplies. A-Frame Tarp Shelter: A-frame shelters are a tarp design that go up fast and give great coverage against rain and wind, when built close to the ground. Wickiup: A wickiup is similar to a tipi, but is made from poles, brush and vegetation, and is best used in climates with occasional rain or hot, dry climates. Leaf Hut: A leaf hut is a two-sided, wedge-shaped lean-to with much better weatherproofing and insulating qualities. Depending on the climate and environment you live in, it might be best to have some shelter materials assembled into a type of shelter kit that is easy to travel with, so you know you always have a way to construct a shelter, if necessary. Knowing how to build a shelter to protect you and your family from the elements is invaluable in the face of an emergency. This summer, don’t take food and water for granted and make sure you are well prepared. 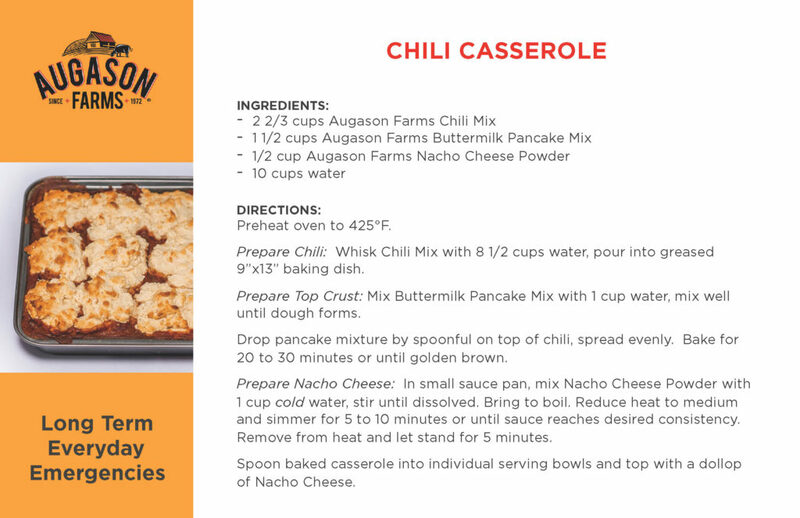 Here are two light weight, compact, and easy-to-carry solutions: Augason Farms 72 Hour 1 Person Emergency Food Pail (weighs just 4 pounds, available at select Macey’s) and the Survival Spring Compact Water Filter (only 2 ounces, available through Augason Farms). 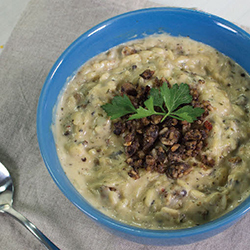 Three ingredients make this creamy and delicious Augason Farms soup. Prepare black bean burger crumbles: In a bowl combine black bean burger mix with 1 cup water. Mix well and let sit for 10-15 minutes. Crumble the prepared black bean burger mix into a lightly oiled skillet over medium heat until cooked through (about 3 minutes). Prepare soup: In a sauce pan, combine contents of Creamy Chicken Flavored Rice pouch with 7 cups of water. Bring to boil. Stir in black bean burger crumbles. Reduce heat to medium and simmer for 20-25 minutes. Try this tasty spin on a classic. 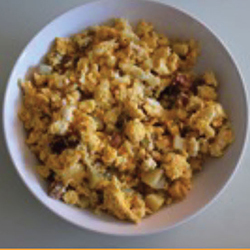 In a medium sized bowl, combine meat, potato gems, onion, garlic and egg powder. Mix together until well combined. 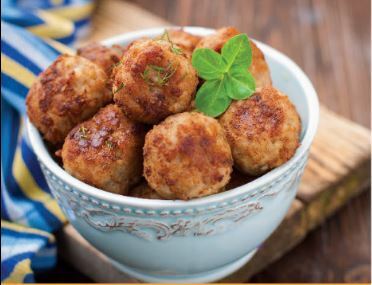 Shape into 1 inch balls, fry in oiled skillet until all sides are golden brown, about 15 minutes. 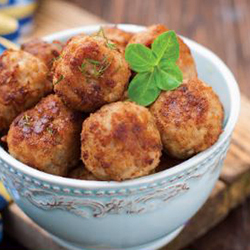 Makes approximately 16 meatballs. 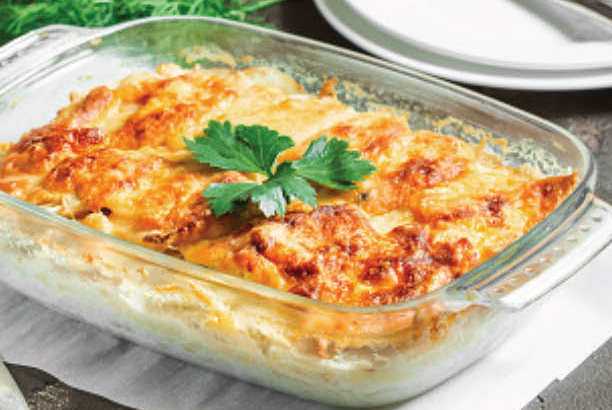 Preheat oven to 375 F. In a large bowl, combine all ingredients except cheese. 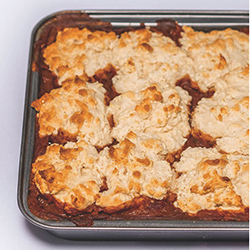 Pour mixture into greased 9″x13″ baking dish. Bake 35 minutes. 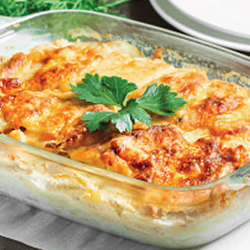 Remove from oven, sprinkle with shredded cheese, and bake an additional 10 minutes or until cheese is bubble. Makes 9-12 servings.